Last Thursday night the weather forecast was calling for the coldest wind chill temperatures yet and while I wasn’t excited about that, I knew as long as I had propane, a working furnace, and my space heaters to supplement, I’d be fine. As it turned out, I wasn’t as fine as I’d hoped. Around 6 p.m. that evening, I was working at my desk when I realized I felt colder than usual. I had my space heater running next to me but it wasn’t helping as it usually did, so I decided I’d check the thermostat to see what it was set to. When I read 58 degrees, I rolled my eyes in exasperation because I’d forgotten to turn it back up when I arrived home from errands. Thinking I’d found the easy solution, I turned the thermostat up a few degrees and waited for the furnace to kick on. The thermostat made it’s usually click sound, the furnace blower turned on and ran for a few moments…and then stopped. The heat hadn’t kicked on and I wondered what the problem was. Beginning some furnace troubleshooting, I tried fiddling with the thermostat settings a little more, but no heat came out of my registers. I finally concluded that the problem must be with the furnace unit in the basement. I put on my boots to go into the cold basement and walked down the stairs nimbly dodging the kittens that were curious about my activities. The first thing I did for the basement segment of my furnace troubleshooting was to inspect the circuit breaker and flip the circuit for the furnace. Once again, the blower on the furnace kicked on, but after a few moments, it turned off without creating heat. The next thing I did was go to the furnace and that’s when I saw two little lights through the cover window. They were both green, but one was flashing. I had no clue what that meant, but I flipped the light style switch on the outside of the furnace to turn it off and on again. Again, the blower turned on, then off, but no heat and the lights were doing the same thing. Now I wasn’t quite sure what to do, but what I did know was that if I didn’t light that fire, I was going to freeze and that thought didn’t appeal. Settling into a sitting position on the cold, cement basement floor, I started reading the furnace cover to see if I could figure out any useful instructions. The diagram on the cover vividly pointed out where the ignition switch was inside the unit, so I decided to unscrew the cover and see what I could do. Making sure the furnace was switched off, I unscrewed the furnace cover and found myself looking at a confusing myriad of parts and circuits. When I looked closer at the tiny LED lights, I saw that there was third light, that it was yellow not green and that it hadn’t been on with the other two. I assume that was the ignition indicator light. Even with the diagram on the furnace cover, I had trouble finding the ignition switch and when I finally did, it was a rather tiny thing located toward the top of the cabinet’s interior. The switch was in the on position, which puzzled me, so I decided to check the furnace filter to see if dirt on it had caused the unit to turn off for safety reasons. Sure enough, the furnace filter had so much dust, cat hair, and dog fur covering it that I could’ve made a dog/cat/dust bunny hybrid. I had three brand new replacement filters that I’d purchased shortly after moving in back in 2011 so I promptly changed out the dirty filter for a nice, clean one. That task completed, I returned to the open furnace cabinet and flipped the ignition switch from on to off and back to on. I figured if taking out my car fuse and putting it back in had fixed the blower problem, perhaps flipping that ignition switch would bring the same happy fortune. Not quite sure my furnace troubleshooting solution would work, I didn’t screw the faceplate on before turning the furnace back on, but I did hold the cover up over the unit in case the flame actually did kick on. Sure enough, the flame poofed into life as soon as the blower had run a few moments and I found myself hastily screwing the cover on. For any DIY furnace troubleshooting people out there, I highly recommend screwing the cover securely on first because propane gas flames aren’t something to play around with. I didn’t suffer any injury, but I’d definitely screw the cover on first in the future! Once I had everything reassembled and heat was coming from the furnace again, I took my cold body back upstairs and started thawing out. Never before had the hum of my furnace sounded so glorious! I was quite proud of myself for fixing the problem on my own and for retaining enough HVAC knowledge to be useful. One of the things I often read in HVAC articles is to hire professional service people for furnace troubleshooting, but as it was Thursday evening and I didn’t want to freeze to death or pay through the nose for someone to flip a switch, I chose to do it myself. I now know what to do should my furnace act up like that again and it’s knowledge that will serve me well. Unless it’s an absolute emergency, I highly recommend that you try to figure out household issues on your own. While it’s “easier” to have a pro do it, it’s not free, and being able to take care of your own house is a very admirable quality. If you’re looking for furnace help, I’d recommend this Furnace Troubleshooting article from BobVila.com. This site often has useful, well-written information. The moral of the story is that when faced with the choice of lighting the fire or freezing to death, I chose lighting the fire. I think it’s a good analogy for life too because if you don’t light the fire within you to pursue your dreams and goals, then you’ll be left behind freezing in the cold of a mundane existence. I don’t think I’ll ever say I love winter weather as an adult, but I’m working on not hating winter. I loved winter as a child when I would put on my snowsuit to go outside and play in the snow with my brothers. Once I started driving in snowy winter weather and experienced the panic of getting stuck in a snowbank and sliding backward down a hill, my love for winter vanished. Although it got a late start (thankfully) this winter has been especially unpleasant with the unending snow and ridiculously frigid temperatures. During the day, I work at my desk with a blanket over my legs and a space heater by my feet to stay warm because my house leaks like a sieve. I hung insulated curtains by my desk and even installed an outlet insulator on the nearest plug, but I still feel a breeze across the top half of my bundled-up body as I work. The sun has been in very short supply recently so when it made an appearance this morning, I was thrilled! I watched it rise over the hills, I took pictures, and I tried to memorize what it looked like. Unfortunately, it disappeared a few hours later and the dull winter sky returned. As I worked, I silently urged the sun to return and magically enough, it did! By noon the sun was in full shine amid a blue sky and I knew I couldn’t pass up such a beautiful opportunity for a walk, especially since it’s supposed to get back down below zero tomorrow. I saddled Jazzmin in her backpack, put on my shape-up boots, zipped up my coat, and led my pup out the door and into the 30 degree winter weather. Knowing we wouldn’t be able to walk again for a while, I took us on the winding hilly road that’s more fun to walk than drive in the winter weather. Jazz was very well behaved and the scenery was cold but lovely. Yesterday a snowy fog lingered all day so today all of the trees were coated with a shimmering layer of ice that reflected the sunlight. 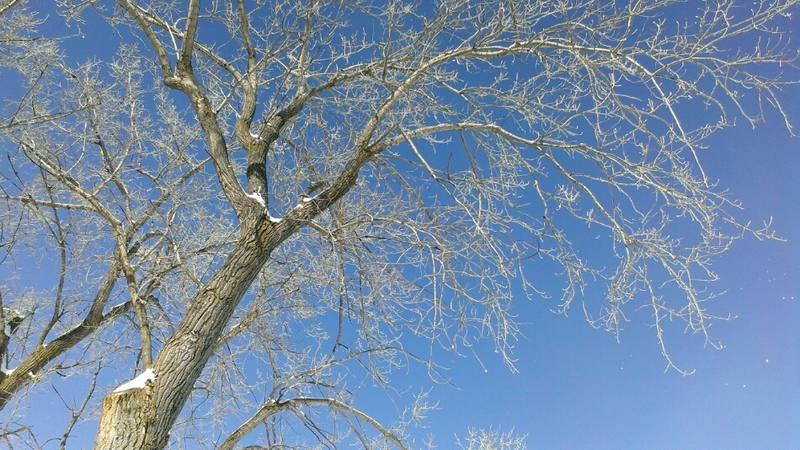 As we walked, the ice and snow began to melt off the trees and at one point we were standing beneath a tree that was creating a gentle, mini snowfall. 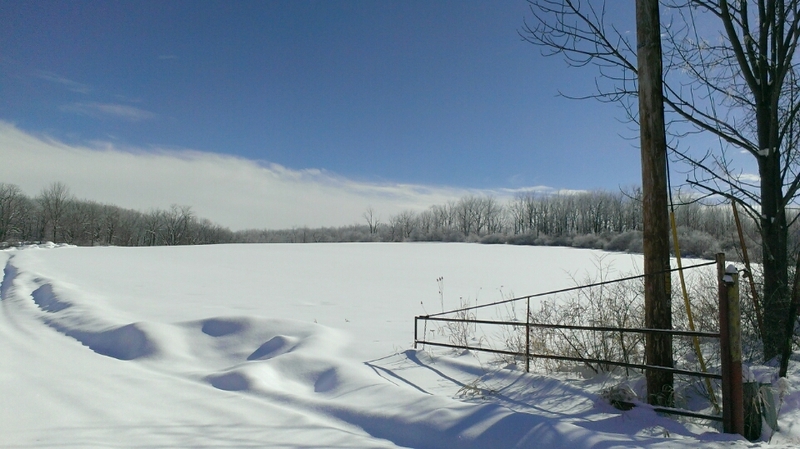 During the walk, I felt my mind and spirit restored and I thanked the universe for the gift of warm sunshine. Finding the beauty in winter weather isn’t always easy for me, but after today I know it’s not impossible. One of my new friends at SNHU changed my life… and potentially my future. She sent me an e-mail, which touched me to the very bottom of my heart. She remarked on my writing skills and suggested that I try ghost writing. She gave me a couple of sites to try. One of those sites was Textbroker.com. This happened a month ago. A month later, I thought that I would write a blog about it. I’m not saying that I am an expect in this field. What I am saying, however, is that I’d like to share my experience so far and my hopes for the future. But first, let me give you a brief overview. Textbroker is a content creation site. Writers can submit content. Organizations, groups, and individuals post writing jobs, which becomes available to the wider community at large. As a writer and artist, I’m on a constant quest for knowledge. While there’s a seemingly endless supply of information on the internet, sometimes I have to take a break from the digital world and lose myself in the physical, tangible pages of printed books. For years, there have been claims that all forms of print media will soon be relics, but I choose to believe that they’ll always have a place in this world. When I can’t seem to find the inspiration and ideas online that I need for my work or personal writing, a trip to the library is exactly what I need. My oldest daughter and I went to the local library the past two afternoons after I picked her up from school because I didn’t want to return home and risk getting stuck in my driveway (for the umpteenth time this winter) before we had to pick up my youngest from school. The local library in the town where I live isn’t very big and would probably fit neatly in one section of Boston Public Library (pictured above), but it provides enough print media to serve as a viable start for my research. Yesterday at the library, I found a handful of ideas for my work writing from flipping through the glossy magazine pages of National Geographic and Smithsonian. The text I read from both magazines was only a couple paragraphs long, but it gained more than enough knowledge from that print media to start the wheels turning in my head. I knew I could find more information on the web and from SNHU’s college library to create quality blogs posts and more importantly, I knew those posts would be truly unique. Being unique on the internet is becoming a greater challenge every day, but I’m not one to back down from a challenge. This afternoon at the library, I found information from magazines and books that inspired me for future personal blog posts. Even more than that, the mere act of reading information from print media reawakened areas of my mind that grow sleepy in the barrage of information from the internet and TV. Awakening forgotten corners of my brain always leads to positive developments that amaze even me and I know that this week’s trips to the library are just the beginning of a new path on my writing and artistic journey. Proper car repair attire. My oldest brother’s Carhartt coat. Last week I received another remind that I’m capable of so much more than I give myself credit for sometimes. It was another cold winter morning when I started my car to warm it up, turned on the defroster and cranked the blower to melt the ice on the windshield. Much to my dismay, I discovered that the blower wasn’t working. The heater was still making heat, but the fan wasn’t blowing it out. I’d planned to visit my mom that day and I continued with the plan even though it meant driving a car with minimal heat. When I was moving, the air would flow through and heat came out the vents, but when I stopped, it became very cold in my car. On the drive to my mom’s, I worried about how much it would cost to get the blower fixed in my car. My Matrix is far more reliable than my old Explorer was, but having something repaired in it was money I wasn’t planning to spend at that point. By the time I reached my mom’s house, I was ecstatic to get inside where there was heat. As soon as my fingers thawed, I texted my close friend and told him my blower stopped working. He responded by suggesting I check the fuse because my car wasn’t that old and the blower shouldn’t be broken. I’d never thought about checking the fuse. In fact, I’d forgotten my car had fuses because I’d never dealt with fuses in any of my vehicles before. My friend texted me a link to some videos that explained how to find and replace the fuses in my car and I realized it was something I could at least try to do. 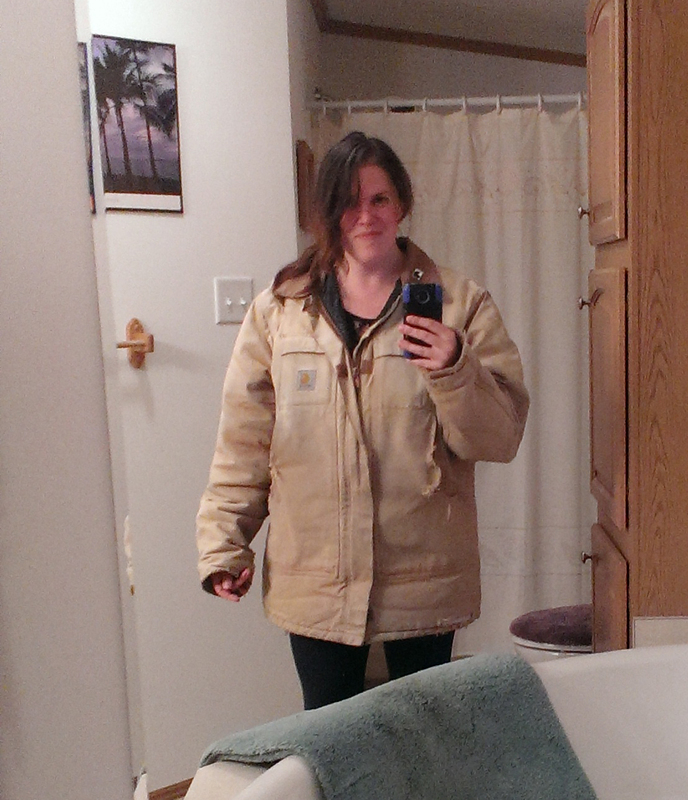 I donned my oldest brother’s old Carhartt jacket because it was more appropriate for car work that involved crawling around on my floor. My brother is over 6 feet tall and I’m only 5’5” so it was a bit large on me, but I knew I’d still be able to work in it. Now in more appropriate car repair attire, I headed out to my car as it sat parked in my mom’s snowy driveway. I crawled onto the floor of the driver’s side and had to twist over onto my back to find the fuse box mounted up underneath the plastic overhang below the steering wheel. I had to lay completely on my back and cram my hands up under the dash to pull the fuse box cover off. I wondered how someone bigger than I would’ve accomplished such a task without becoming stuck on the car floor! Once I had the fuse box cover off, I went back inside the warm house and had to decipher what the guide on it was telling me so I could find the location of the blower fuse. After much studying, I finally found the right spot, and headed back out with a pair of my small jewelry pliers in hand so I could pull out the fuse. I crawled back into my car, laid on my back, reached my hands up under the dash…and realized I couldn’t get the right angle on the fuse to yank it out with the pliers. Refusing to give up when I’d gone that far, I went back inside, fetched my bent nose jewelry pliers and contorted my body into position again on the floor. That time I was able to get a hold of the tiny fuse and pull it free to examine it. I’d seen in the video what a blown fuse looked like and the fuse I pulled out was in perfect condition. Dismayed by the discover that it apparently wasn’t a fuse problem with my blower, I put the fuse back in its spot, snapped the fuse box cover back on and moved to sit in the driver’s seat. On a whim, I put the car in accessory mode and turned the blower dial. Much to my delight, air started blowing out! The fuse wasn’t blown but somehow my tinkering with it had fixed the issue and the blower worked again! I was so proud of myself I almost squealed with delight, but I decided that might’ve been a bit over the top and instead did a little happy car seat dance. That’s the first time I’ve done more to my car than fill it with gas, top off the washer fluid, or get it washed and it showed me that I’m capable of so much more than I believe sometimes. Now that I know where that fuse box is and how to replace fuses, that knowledge can save me money and frustration in the future, which is always a good thing! Not only that, but I upped my cool chick points too. If you found this post helpful, check out my furnace troubleshooting post about when my unit wasn’t producing heat.